Smooth rich paint made from finely ground pigments can be thinned with water or thickened with mediums for different effects. * All colors are ASTM rated lightfast of 1 = excellent. * Transparency rating: T=transparent ST=semi-transparent O=opaque SO=semi-opaque 90ml (3 oz.) 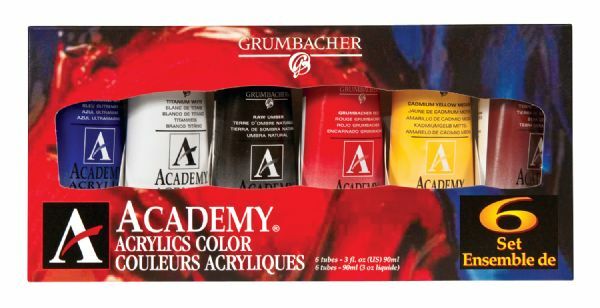 tubes in 6 colors: Burnt Sienna Cadmium Yellow Medium Grumbacher Red Waw Umber Titanium White Ultramarine Blue. 10.25" x 5.2" x 1.6"